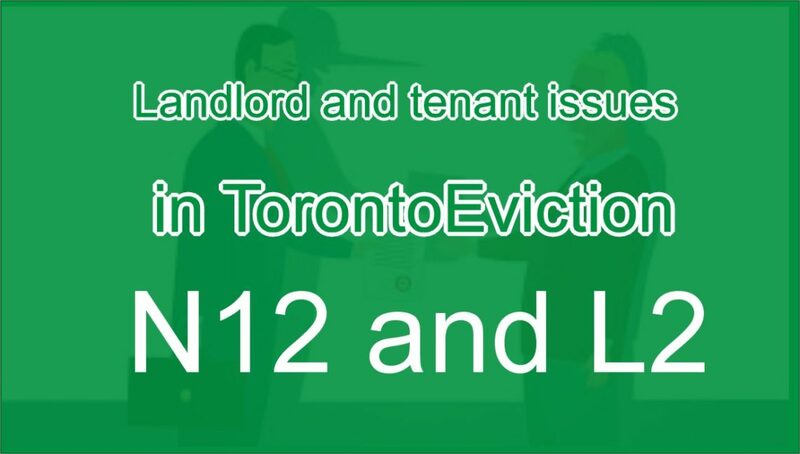 Landlord and Tenant Board in Ontario/ N12 Notice -L2 application; Eviction for Landlord/Purchaser’s own use. The landlord who wants to occupy their own residence at the end of the lease term or rental period, shall serve N12 Notice to the tenant and file the L2 along with the copy of the N12 and Certificate of Service. This application requires the landlord to file an Affidavit stating that the occupancy of the residential unit is required by the landlord in good faith for residential purposes at least for a period of not lesser than one year. The tenant who is opposing the landlord’s N12/L2, shall prove that the landlord is bringing the application in bad faith. The landlords need good preparation with documents and all other pertinent documents showing that the application is in good faith with true intention to occupy the unit at least for one year.